Life Link: Genma may redirect damage she suffers for any reason to one of her Summons in play. 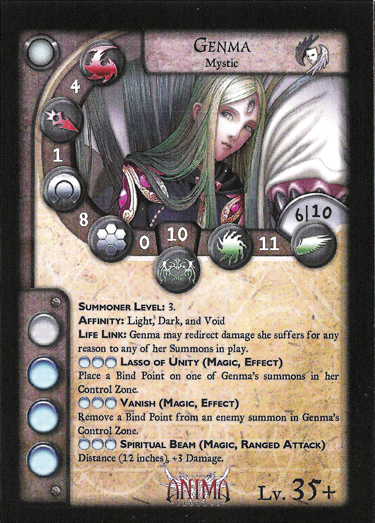 Place a Bind Point on one of Genma's Summons in her Control Zone. Remove a Bind Point from an enemy Summon in Genma's Control Zone. Distance (12 inches). +3 Damage. Genmar Pheriu Dhanyata is one of the few Devah left in the world, a true rarity even within Samael. Though she has little combat skill, her mastery as a summoner knows no equal. Even the Fallen Angel Jigoku no Kami has acknowledged that, with regard to the invocation of supernatural entities, Genma is his only rival.